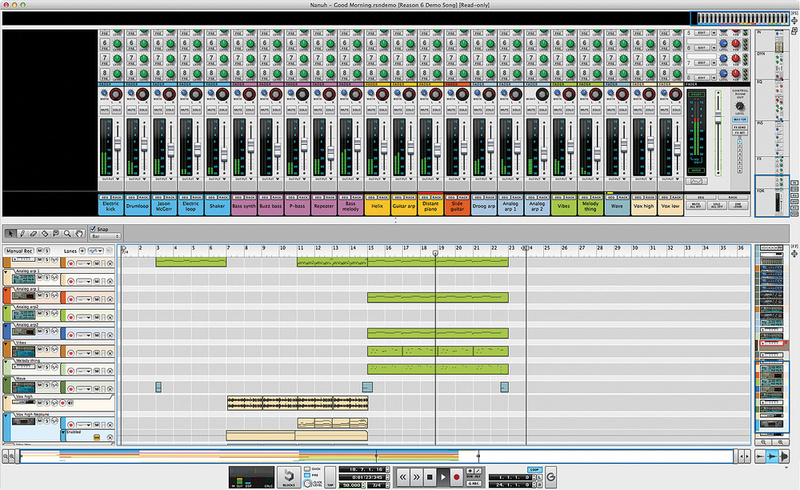 The three main components of Reason's interface: the virtual rack, stuffed full of bundled devices (left), and the sequencer and mixer, shown tiled in a single window (above). Propellerhead have never been afraid to plough their own Scandinavian-style furrow, and Reason, their main Mac/PC DAW application, has always been an unashamedly independent and quite insular affair. For nearly 13 years, it has resisted any kind of plug-in support, has steadfastly refused to drive any MIDI device other than its own synthesizers and samplers, and, until very recently, offered no way of adding to its complement of bundled virtual devices. As a result, many 'traditional' DAW users have branded Reason an inflexible toy of the recording software world. Propellerhead must know what they're doing, though, because the studio snobs have always been heavily outweighed by legions of bedroom-based producers who have fallen in love with Reason, enticed by its phenomenal bang-for-buck, and positively embracing its pop-production focus and simplicity. With version 7, though, some of the walls around Reason's self-contained world are beginning to crumble. The traditional DAW crowd might be forced to rethink its Reason prejudices. Meanwhile, existing users could find themselves revelling in previously undreamt-of freedoms. Versions 1 to 5 of Reason all had a similar fundamental design, built around a virtual rack that houses soft synths, samplers and effects, plus a fairly straightforward sequencer. In 2009, version 5 was joined by a sister application, Record, which added audio tracks and introduced a modular mixer that grew as your arrangement did. Reason and Record could be run separately or together. The next version, Reason 6, was, in essence, the Reason/Record combo without the double-application confusion, and spelt the end of Record as a separate product. Amongst the Propellerhead faithful, version 6 marks the beginning of the modern age, with all subsequent updates and releases building on its fundamental design. Version 6.5, arriving in 2012, was even more momentous. A new Rack Extension format — Propellerhead's take on the concept of plug-ins — opened up the virtual rack to third-party developers, and suddenly shop.propellerheads.se gave us a whole new way for us to spend our hard-earned cash. 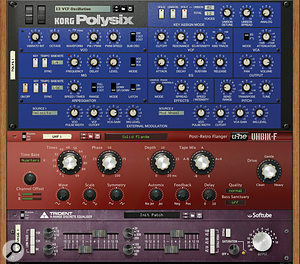 New rack devices became available from Korg, Izotope, Softube, Rob Papen, FXpansion and countless smaller developers. 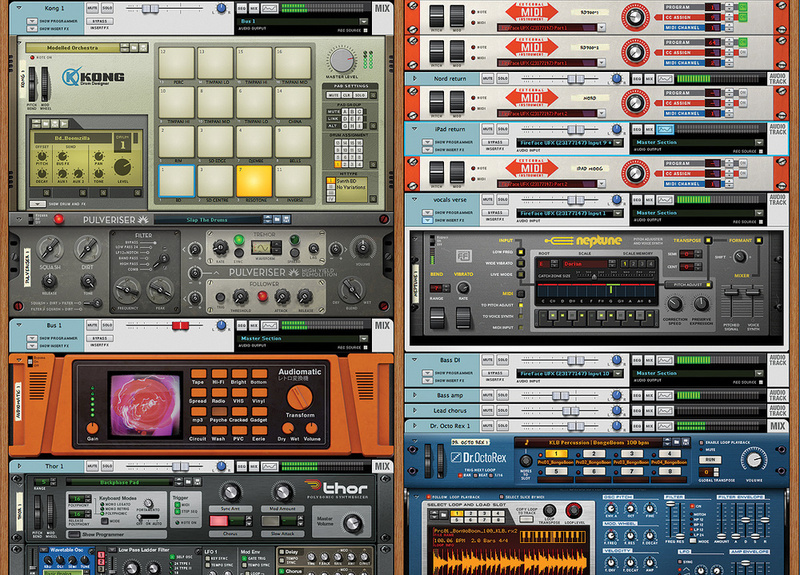 The format continues to expand, and Propellerhead offer their own range of add-ons too. If Reason hasn't shown up on your DAW radar before, or you've just arrived from another planet, you might want to check out my November 2011 review of Reason 6, which goes into some detail about the nuts and bolts of the application, and its individual bundled rack devices (to which only the Audiomatic Retro Transformer has been added since). If you haven't got time for that, here's a whirlwind resumé to cover the basic concepts. Modern-day Reason has three components: rack, mixer and sequencer. They can be viewed in any combination tiled in a single window, or detached to make the most of big screens and multiple monitors. Flexible 'inspectors' take the place of conventional scroll bars, and a small low-slung transport strip supplements the sequencer at all times. This lot is your interface for working on Reason 'songs', of which you can open many at one time. The rack is effectively Reason's alternative to other DAWs' plug-in insert slots, and the devices it hosts span a broad range of synths, samplers, drum machines, effects, processors, mastering tools and utility gizmos such as splitters, combiners and mixers. Many have a unified patch management system that can load preset material from factory sound banks and other add-on 'ReFills'. Rack devices mimic their hardware equivalents in having not only functional knobs and sliders on their front panels, but patchable cables and sockets on the rear as well. Audio cables can be replugged, deleted or created from scratch, and Control Voltage connections allow modulation-type connections between devices too, very much in the manner of hardware modular synths. 'Normal' use of Reason (whatever that is) doesn't require any interaction with back-of-the-rack cabling, but it's there to provide remarkable levels of flexibility when you need it. Add-on Rack Extension devices push the possibilities still further, and are the only way of adding to the bundled 'factory' devices. There's no support for plug-in formats like VST or AU, and almost certainly never will be. 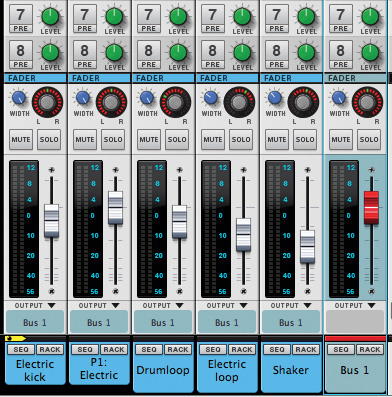 The mixer automatically presents channels for instruments and audio tracks. Each has a very tall channel strip, resembling those found on large-format hardware mixers, with built-in EQ and dynamics, eight aux sends and four insert loops. Mixing is stereo-only, with no support for any surround formats. Reason 7 adds bus/group channels for the first time, letting you submix entire drum kits, layered guitars and so on to one fader. A master (output) section has its own inserts and a dedicated bus compressor. There's also a separate control-room output, independent of the main stereo output, that allows you to (amongst other things) set up pre-fade aux headphone mixes on your control room speakers before sending them to your talent. The sequencer is a standard timeline-based design, displaying MIDI/instrument and audio tracks side-by-side, with a single Transport track handling tempo and meter changes. Track info and configuration options are found at the left, and include input level meters, audio input choosers, and a chromatic tuner on all audio tracks. Track data is contained in 'clips' that can be manipulated with a small palette of seven tools, and subject to more detailed editing after double-clicking. MIDI clips open in a typical 'piano roll' editor with separate lanes for device parameter automation and MIDI CC data. Audio clips are handled in a dedicated multiple-take comp editor or 'inline' when working with sliced audio, and also carry all associated automation data in separate lanes. Parameters associated with individual clips appear in an info strip at the top of the sequencer as you work on them, and various extra editing actions and project management features are available in an optional floating Tool Window. Finally, while the sequencer can be used perfectly well in a completely linear fashion, Blocks mode offers an alternative, whereby you work on individual song sections and then arrange them into larger structures. Very good-quality audio track time-stretching is constantly enabled, so recording and playback tempos need not be the same. Audio tracks can be manually set to use one of three time-stretch algorithms for best results, and audio clips can be transposed by up to an octave in either direction for tuning and re-pitching loops and other creative uses. Entire song mixes, loops, and user-selectable groups of channels (think 'stems') can be exported as AIFF or WAV files. Sliced track audio can be bounced as a REX 2 file for use by other Reason devices, or exported. Audio import handles AIFF and WAV as well as MP3, WMA and AAC, and isn't fussy about resolution and sample rate. MIDI import and export are possible using Standard MIDI File format. Multi-channel audio interfaces are fully supported, and there is a range of monitoring options to cope with in- or out-of-the-box preferences. Many common MIDI controllers are automatically recognised, though new and generic ones may be configured too. Dedicated functions allow hardware knobs and sliders to be mapped to device parameters. Thirteen years after it was first introduced, Reason can drive external MIDI devices at last, courtesy of the new External MIDI Instrument rack device. Those are the facts, but what about the experience? On the whole, working with Reason feels fast and direct, with most actions achieved through mouse clicks, keystrokes or contextual menu commands rather than main menus and dialogue boxes. The group of five main menus mostly access global-level commands and configurations, and are required only rarely in the course of production. Processing demands in Reason 7 remain remarkably modest compared to most other DAWs, and the user interface stays responsive even under heavy processor load: it's a seriously efficient application. Thinking more generally, there's no doubt that dedicating yourself to working in Reason, and turning your back on the world of plug-ins familiar to most other DAW users, can feel like quite a commitment, and possibly even rash or risky. You confine yourself to a life apart from the likes of Native Instruments, PSP, Waves, Universal Audio, Sound Toys, Celemony and any number of other fantastic developers who haven't yet embraced the Rack Extension format. However, the flip side is an ease of use, lack of authorisation hassle, and general quality of life that the traditional DAW user can only dream of, which can help keep you focused on your music rather than constantly tending your setup. Take authorisation, for example, which is very flexible. For the first time, Reason 7 lets you permanently authorise an individual computer, via a web-based process. But if you move around a lot, you can opt to keep your licences on an Ignition Key USB dongle, or leave that at home and just authorise via the web using your Propellerhead user name and password when launching the application. You're free to install Reason on as many computers as you like, and log in as required. As for for Rack Extensions, although they're offered by many separate developers, they're only available from one source — Propellerhead's online shop — and when you buy one, it's registered on your user account. The idea is similar to iTunes and Apple's App Store. Consequently, it becomes almost ludicrously easy to keep your own complement of Rack Extensions bang up to date with the latest versions, to restore them in one fell swoop after buying a new computer, or to download and authorise them to someone else's computer when out and about. In each case, it's a quick, automated process via the Propellerhead web site, and could bring a tear of joy to the eye of anyone who's endured the endless reinstallation ritual associated with a conventional DAW and even a modest number of third-party plug-ins. All of which brings us to Reason 7 and its headline new features: MIDI out, audio slicing and quantising, a graphical front end for channel EQ, several important mixer enhancements, and a new effect rack device. The absolute number one new feature in Reason 7 is that MIDI out. How have Propellerhead implemented it? Well, to coin a marketing phrase, there's a rack for that: specifically, the new External MIDI Instrument rack device. When you create one, it appears in the rack and a sequencer track is created along with it. Each EMI can then address a single channel of any MIDI output available to your computer, including hardware MIDI interfaces, virtual inter-application outputs, and network ports. It's all very straightforward. Front-panel controls are fairly limited, and aside from an output and channel chooser, there's only a simple Program Change parameter and a single knob for sending values of a Continuous Controller number of your choosing. The pitch-bend and mod wheels at the left-hand side do generate their associated data types when dragged with the mouse, but are really there more to provide visual feedback. Tests I made across the whole gamut of MIDI output types threw up no difficulties on my setup, and all normal sequencing use of the EMI proved reassuringly reliable. There's very little to learn: you just get on and start using it. Most controls can be automated, and the CC knob isn't limited to generating only one controller message type, just one at a time. It's possibly more interesting to note what this new device doesn't do, though. First, it doesn't 'see' any individual MIDI devices that Mac users may have described as being attached to their MIDI ports in the Audio MIDI Setup application. That's not a huge problem, but it does mean that you have to remember exactly what MIDI gear you have connected to your outputs, especially if you have several of them and a number of MIDI devices. Second, there are no facilities for dealing with MIDI latency. Let's say you have a hardware synth that takes 10 or 20 milliseconds to respond to a Note On message. The EMI offers no facility to send its MIDI 'ahead of time' to compensate for that. Again, not a deal-breaker, because if it's a problem you can nudge your MIDI clips back in the sequencer timeline. Third — and maybe this is a little more important for some — it's clear that the EMI does not turn Reason into an all-encompassing 'MIDI control centre' for a big rack of hardware modules. There are no patchlist, patch naming or external device management features. Standard Program Change messages can be generated, but CC 0 or 32 Bank Select values must be written manually into the sequencer track using editing tools. System Exclusive data (and, in fact, anything other than note, controller and pitch-bend data) isn't handled at all. All Reason 7's marketing imagery shows it driving a few external modular or vintage analogue synths, and that's no coincidence. It will work with your modern Roland or Korg workstation just fine, no question, but with less aplomb than some other DAWs whose roots stretch back to the heyday of the MIDI module. A general consideration around Reason's MIDI tracks is how you'll monitor the instruments they drive. You can bring external synths' audio back into Reason via monitor-enabled audio tracks, but you'll need an audio interface with a lot of inputs if you're working with several synths. Stand-alone soft synths offer their own problems: there's no dedicated feature for handling their audio, and your best bet is to use inter-application audio gizmos like Soundflower or Jack, or some kind of real or virtual 'loopback' routing in your audio interface. Reason 7 gets a slice (sorry...) of the 'elastic audio' action with a simple but effective new scheme for manipulating the timing of audio within clips. The other Reason 7 biggie is sliced audio editing. Now, when you record or import audio into Reason, it's automatically analysed for percussive or 'transient' content. Double-click an audio clip in a sequencer track and the results of that are revealed in an 'inline' editing mode: the clip is shown superimposed with Slice Markers that indicate where significant rhythmic or melodic events take place. Reason has long had the ability to time-stretch individual clips, over and above its general 'always on', tempo-independent audio playback features, but this is different. This is manipulation of events within a clip, and you'd use it to correct sporadic timing problems, quantise entire audio takes, or for creative ends. Compared to how the same end is achieved in some other DAWs, the implementation here is fabulously straightforward. There are no special editing tools, and almost everything is worked via those Slice Markers. If you want to reposition an audio event in a clip, just drag its marker: the slice, and the one to its left, scales up or down in size to compensate for the new timing. To quantise the audio in a clip, select all the markers and apply Quantise in the normal way. To move a group of slices and maintain their original timing, click and drag to select their markers, then drag a 'handle' that appears at the bottom of the clip. (Drag an individual marker instead, and the timing of the selected slices is scaled relative to each other, leaving other slices in their original positions.) Other obvious tasks, such as adding, deleting and repositioning markers, are entirely intuitive: you click with the pencil tool, hit the backspace key, and drag with Ctrl/Alt respectively. Reason 7's slice analysis also lets you export audio clips as REX loops, via a contextual menu command. That gives scope for a drum pattern you've recorded to be opened in the Dr OctoRex device, and seriously monkeyed around with, for example, or for you to assemble libraries of your own loops for use in other songs. Propellerhead's 'elastic audio' implementation does have a few down sides, though. To begin with, there's no way to adjust the sensitivity of Reason's slice recognition. Most of the time it's just about perfect, but a recording I made of mildly overdriven electric bass resulted in many redundant slice markers appearing within the natural decay of each note, and most would have had to be painstakingly deleted ahead of certain editing actions. Then there's a slight awkwardness in the way slice editing works if your track contains multiple takes. It's not unreasonable that Reason 7 requires you to have comped and bounced multiple takes before allowing you access to slice-style editing, but accessing and exiting the various editing modes can initially be bewildering, and less than intuitive. Most importantly, though, slice editing and quantising is strictly a single-clip-at-a-time affair, and has little to offer in fixing up multitracked drums — a task for which it would seem to offer such obvious potential. The lack of any 'grouped' clip-editing features is just a facet of a more general grouping weakness I'll be coming back to in a moment. It also seems a shame that now we have sliced audio editing we don't have track-level pitch correction to go with it. Yes, it's true that Reason has, for a while, included the Auto-Tune-like Neptune Pitch Adjuster. That fine device can fix intonation lapses for monophonic audio automatically in real time, or be automated via a MIDI note input. It's also possible to turn slices into separate clips, and use their clip transposition feature to correct gross errors. But neither is quite the same as the Melodyne-like (or even Melodyne-based) features that are becoming increasingly common in other DAWs. Two sides of the same coin: now users can decide between adjusting EQ settings with traditional mixer channel knobs or a floating window that's accessible even when the mixer is hidden. The next new feature is not ground-breaking, but really nice to have. The new Spectrum EQ is a resizable floating window that's brought up with a mixer or rack button-click, or a tap of the F2 key. It's a graphical front end to the EQ that's built into every channel of Reason's mixer, and superimposes an EQ curve, and handles to manipulate it, on top of a real-time analyser. 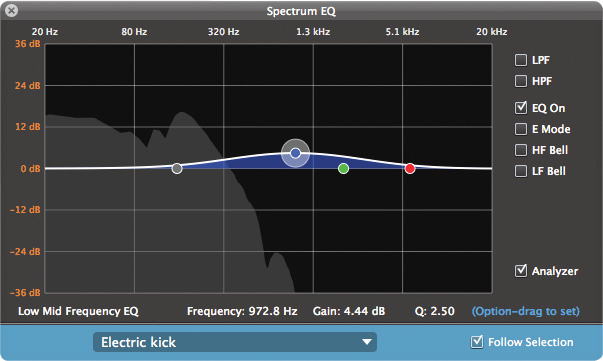 The analyser's 'graph' is pre-fader but post-EQ, so it confirms the results of your EQ cuts, boosts and filters as you work. The window can automatically show the EQ state for your currently selected track, or be set manually to stick with just one. 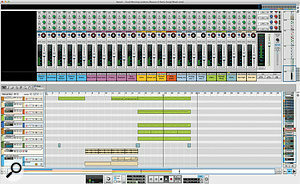 The analyser window can also be opened for the mixer's Master Section, as a kind of mastering assistant. My testing experience of Spectrum EQ was all good, to the extent that I can't see myself using the channel EQ knobs very much in future, and I'm quite happy to hide them from the channel strip line-up. Another welcome new feature is Bus channels. You know the kind of thing: let's say you have eight tracks of drums, and want to apply some compression to a submix of all of them. In Reason 7, you just select the eight channels in the mixer, choose Route To / New Output Bus in the context menu, and suddenly they're all re-routed to a single mix channel, which then feeds into the main stereo mix bus. A quick switch to the rack and you can insert a compressor of your choice for the new mix channel, or just use the built-in dynamics in its channel strip. This is a great labour-saving tool, and the way it's implemented includes some nice touches. Bus channels appear in the mixer with red fader tops above a coloured backdrop, to help you recognise them. The same colour is automatically selected in an Output panel above the names of the tracks that feed that bus, so visual confirmation of routing is clear and unambiguous. What's more, for very complex requirements, bus channels can themselves feed other bus channels. All we need now is a way to collapse or hide the constituent channels that feed into a bus when required; this would make the mixer for a really big arrangement a much more organised and less intimidating place to work. New bus channels in Reason 7 — you can see one here with its distinctive red fader — make mixing easier and let you easily apply insert effects to a group of channels. Also check out the 'Electric Kick' track, with its Parallel channel neighbour. Hand in hand with this new-found routing flexibility come Parallel channels. Right-click a track (or, indeed, a bus) in the mixer and choose Create Parallel Channel. The result is, um, a new parallel channel, right next to it, with the prefix 'P...:' in its name. Both channels carry the same signal, and the idea is that you'll load up one with some aggressive compression for so-called 'New York'-style treatments that blend thickening and pumping with linearity, for the best of both worlds. Drums are the obvious candidate. As ever, there are also important improvements beyond the headlines. As mentioned earlier, Reason 7 has improved audio-import chops, and can cope with MP3, AAC and WMA, as well as standard uncompressed WAVs and AIFFs. It can't export in the compressed formats, though, which is rather disappointing. Nor is there any integration with online audio sharing services like SoundCloud. It's got an enhanced factory sound bank too, with more audio loops and patches for some devices, though not Orkester. From the buzz on the Internet that caused Propellerhead's web site to crash a few times on Reason 7's launch day, it's clear that Reason has a heck of a user base, apparently desperate to avail itself of the new features. For established and contented Reason users, version 7 is just more, bigger, better. Nothing was taken away, but huge potential was added: to utilise the MIDI gear in your studio, to edit and mix audio in new and useful ways, and to develop your work more fluidly than ever before. And, of course, those same new features also open up new markets, making Reason a viable prospect to those users who might never have considered it before. Compared to the many other DAWs now duking it out in the market, however, the flip side of Reason's individuality is that some unevennesses in its feature set are beginning to stick out. The lack of surround mixing and video support are obvious deficiencies, but they would be useful only to a small subset of users. Much more concerning, I think, are limitations in the basic design of the application, and the sequencer especially. The lack of various kinds of multitrack editing is my number one bugbear. For example, when dealing with multitracked drums, you want to be able to comp-edit all the tracks involved simultaneously. The same goes for quantising them, or fixing timing problems with flexible audio schemes. Reason has a great comp editor, and now beautifully simple sliced audio editing too, but neither works on more than one track (or clip) at a time. Multitrack comping, time tweaking and quantising just aren't possible. That sets it seriously behind much of its DAW competition. I also think it's time Reason had ways of grouping channels in the mixer, both to manipulate their faders en masse, and simply to hide them when necessary. Having Bus channels helps, but that's just the first step of several that are needed to deliver a really flexible, sophisticated mixing environment. 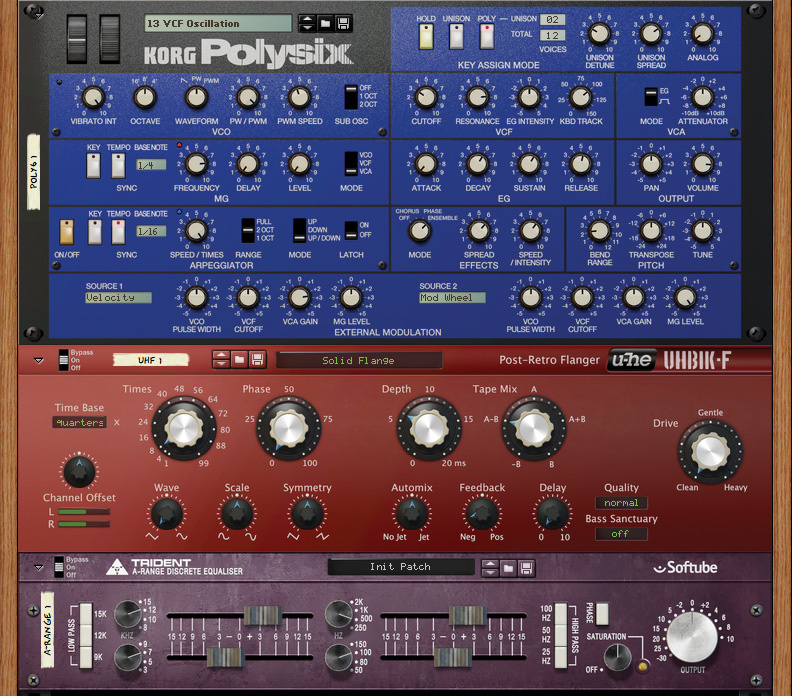 Korg's virtual Polysix synth, u-He's Uhbik-F Flanger and Softube's superb Trident A-Range EQ: just the tip of the Rack Extension iceberg.Back to the sequencer, there's no simple crossfade functionality when two audio clips overlap. You have to use two tracks, or delve into the comp editor, which instantly screws up sliced audio editing. There's no punch in/out, no markers, no track folders or grouping, no individual zoom levels for tracks. The Reason sequencer is in many respects still a basic, Spartan thing. Turning to the rack, my love for all those interesting devices that can go in it (and the amazing possibilities for interconnecting them out back) is tempered by the fact that it can all get a bit out of hand. Even for quite modest productions, the rack can get crazy big, and the information it presents dense and confusing. You can 'fold' devices, but I wonder if the day may be upon us when being able to collapse entire columns, or miniaturising whole areas of devices, could be a useful improvement to the user interface. Oh, and while I'm at it, the time could be ripe for the introduction of a much better sampler — either from Propellerhead or another developer — to put Reason head-to-head with the industry plug-in big boys. A more organised device chooser would also be welcome, especially for users who have dozens of Rack Extensions. So much for my peeves, which I hope Propellerhead get on to sooner rather than later. In the meantime, I can honestly say I have never had so much fun working in Reason as in version 7. It has absolutely not turned into a clone of every other DAW, but retains a unique character and individuality that is, for the most part, refreshing and inspiring. The MIDI out feature is done very nicely, implemented in a way that reflects the fact that most Reason users are more likely to want to bring on board their Minibrute, Volca, Litte Phatty or iPad rather than a rack of JV1080s as long as your arm. The sliced audio implementation is superb: so intuitive and easy to work with. I felt I'd mastered it in about 10 seconds. Other enhancements are great too, with the expanded routing possibilities in the mixer being particularly welcome. With version 7, Reason has upped its game massively. It's starting to look like a real-deal DAW but has lost none of its focus and immediacy. It's probably no nearer being the platform of choice for big, busy commercial studios, which need every scrap of flexibility and compatibility going. However, for the bedroom and small-studio producer (who has always been the apple of Propellerhead's eye) Reason 7 is a force to be reckoned with. You can make commercial-quality music with it, it's fast, efficient and focused, and it sounds better than ever. It's no longer the ring-fenced environment it once was, and yet life with Reason — from installation to sharing songs with collaborators — is just so darned easy! This is a DAW whose independent attitude just got a lot more persuasive, and for the right kinds of users, could be pretty much irresistible. Plenty of modern, streamlined DAWs — not least Apple's GarageBand and Presonus's Studio One — blend simplicity and focus with a range of bundled instruments, loops and effects. But it seems there are currently no contenders using Reason's 'virtual rack' design, with the likes of Arturia's Storm Music Studio long since abandoned. The Audiomatic Retro Transformer is, aside from the External MIDI Instrument, Reason 7's lone new rack device. It's very much in the mould of the 'one knob' plug-ins from Waves and other developers, but with a bit of a twist. Rather than dealing in standard audio concepts, it does for audio what Instagram or Snapseed does for photos, adding character, flavour and attitude based on some loose concepts. They're presented on 16 buttons labelled Tape, Hi-Fi, Bright, Bottom, Spread, Radio, VHS, Vinyl, MP3, Psycho, Cracked, Gadget, Circuit, Wash, PVC and Eerie. A Transform knob controls strength and character, with just Gain, Dry/Wet mix and Volume knobs to accompany it. A completely pointless virtual CRT display rounds things off, but at least confirms that the conceptual similarity to lo-fi image editors is deliberate! A purist, curmudgeonly part of me hates effects like this. But the rest of me, the bit that just enjoys playing around with sounds and production, absolutely loves it. Every single 'flavour' is likeable, useful, and sounds really good, succeeding in its mission to add character to individual sources or entire mixes with almost no fuss. Some are more subtle than others, but all are friendly front ends for effect chains and interactions that are presumably of considerable complexity, and I wouldn't mind betting that some are convolution-based. 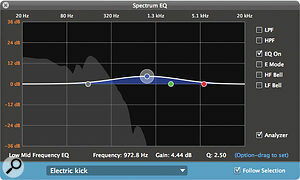 Hi-Fi, for example, subtly introduces a 'smile' EQ curve that works wonders on mixes that need a bit of middle-taming. The more in-your-face lo-fi Vinyl, Radio and VHS are ideal candidates for short-lived ear-candy treatments of instrumental groups or entire mixes. Left to its own devices (ha! ), Reason gets more and more capable with each update. But there's no doubt that laying out a bit of dosh on Rack Extensions significantly increases its scope, and can get you sounds and treatments unavailable otherwise. With over 100 Rack Extensions already available at the time of writing, there's clearly not space here to go into them all. But here's a quick round up of some of the best offerings. 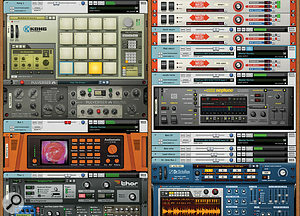 Propellerhead have their own range of add-on, paid-for devices. Radical Keys and Radical Piano are flexible modelled electric and acoustic pianos, and PX7 is a faithful recreation of the groundbreaking Yamaha DX7. They're all €79$99. Effects include the €55$69 Polar, a complex pitch-shifter/harmoniser, and the excellent €39$49 Leslie speaker/amp simulator, Rotor. The most heavyweight third-party developers with Rack Extension offerings are Softube. Their Valley People Dyna-mite and FET Compressor (both €119$149) are amongst the best dynamics processors currently available in Reason, and the €119$149 Trident A-Range is probably the nicest 'outboard' EQ. Synthy goodness comes in the form of Predator-RE (€99$119) from Rob Papen, Antidote (€119$149) by Synapse Audio, Polysix (a mere €39$49) from Korg, and the Mellotron clone Re-Tron (€79$99) by GForce Software. There's also an underground movement in cheap modular synth devices from a number of small developers. Yes, Reason's rack works well as a virtual modular environment, and already there's considerable scope for designing your own synths from oscillator level upwards, and wicked modulation schemes to go with them. As for bread and butter reverbs, delays, stereo effects, beat slicers and filters, there are loads on offer, from any number of developers, such as the brilliant u-He, Sonic Charge and FXpansion. Bottom line: these days, Reason is far from being a closed, limited environment, and your credit card will be in constant danger of taking a pounding. Mac OS X users need to be on OS 10.7 (Lion) or later and be running a dual-core Intel Mac. Windows people need Windows 7 or later and a dual-core Intel or AMD chip. Whichever side of the fence you're on, you'll also need to have at least 4GB of RAM, 3GB (and preferably 20GB or more) free hard disk space, and an Internet connection for registration and authorisation. There are still, in fact, two versions of Reason available. This review concerns the full-blown Reason 7. However, at a lower price point there's Reason Essentials. It lacks some of the best synths and effects devices, has a cut-down mixer (with lesser EQ, fewer sends, no channel dynamics, and no groups or parallel channels), a smaller sound bank, more limited editing facilities, and no MIDI out. That said, it's still surprisingly capable, and would make a great beginners' or kids' DAW. Welcome new features, including external MIDI tracks, 'sliced' audio editing and more. The Rack Extension add-on device format goes from strength to strength. Bundled devices offer scope for complex, great-sounding productions. Life 'around' Reason — authorisation, installation of third-party add-ons, and so on — is blissfully simple! The lack of track, channel and edit grouping schemes is holding back Reason's full potential. Still some weaknesses in general editing procedures and song management. A more sophisticated sampler device would be a welcome addition. New-found links to your external MIDI gear, improved audio editing and an ever-growing choice of Rack Extension add-ons make Reason 7 into a quite formidable DAW. If it suits your musical leanings and way of working, it could be a no-brainer. £349; Reason Essentials £99; upgrade from earlier versions £99. Prices include VAT. $399; Reason Essentials $99.99; upgrade from earlier versions $129.99. Line 6 +1 818 575 3600. 2011 Apple MacBook Pro, 2.2GHz Intel Core i7 with 8GB RAM, running Mac OS 10.8.2.